Major William F. Beattie MC. 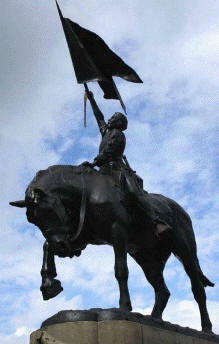 William Francis Beattie (1888–1918) sculptor, was born in Hawick, the only son of sculptor Thomas and Annie. His father moved the family to Hawick and he was educated at George Watson’s and then attended the Edinburgh College of Art, where he eventually became a member of staff. He also joined the Brunstane Rugby Club and Portobello Amateur Rowing Club. In 1910 he joined the Lothian And Border Horse volunteer regiment. He set up business for himself as a sculptor in Edinburgh. In 1913 this young Hawick sculptor received a commission from his home town to produce a monument to commemorate the four-hundredth anniversary of the skirmish at Hornshole, during which a band of young Hawick Callants routed a troop of English horsemen and stole their flag. On June 4, 1914, William's 1514 Memorial (or 'The 'Horse' as it is more commonly known) was unveiled and Mr Peter Scott, the managing director of 'Pescos', said to the gathered crowd of thousands that: "Mr Beattie had placed them under the deepest obligation by the wonderfully appropriate design of the statue, it was the inspiration of a true born Teri. In their young sculptor they had one who was a credit to his father and his native town, a Teri in spirit as well as in name." 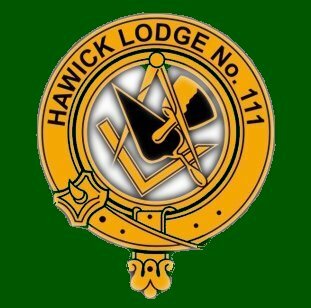 He went on to predict that William Beattie "was a young man with a great future before him and at no distant time would no doubt be one of Hawick's most distinguished sons." Two months after the unveiling, the Great War broke out in Europe. William joined the artillery and was awarded the Military Cross for bravery in carrying wounded soldiers despite being under heavy shellfire. In 1918, he was badly gassed and spent more than five months convalescing back in Britain. He made a slow but steady recovery and rejoined his unit in September 1918. 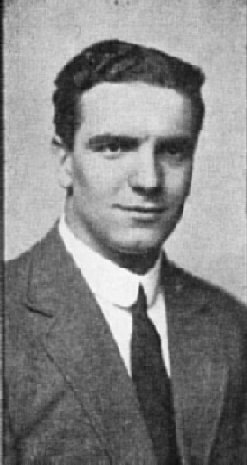 But, just two weeks later, William was fatally wounded in action and died at a casualty clearing station in France on October 3, 1918. It was only five weeks until the end of the war. In 1921, fully seven years after its unveiling, Thomas Beattie returned to complete the final details on his son's '1514' memorial, work which had been interrupted by the outbreak of war. With the skill of a master craftsman and the love of a bereaved father, he carved the words: 'Sculptor Major William F. Beattie MC RFA, a native of Hawick, born 1886, killed in France 1918'. Fate had decreed that William Beattie was never destined to become one of Hawick's most distinguished sons as Mr Peter Scott had predicted. Instead, William joined the ranks of the fallen in that doomed generation – nearly 1,000 men perishing from the local area alone. In death, William's 'Horse' monument became both a commemoration of Hawick's old victory and a symbol of our more recent loss. It is a contradiction, a celebration of the perceived pre-1914 view of war as being honourable and glorious set against the realisation that there is no greater folly known to man than war. In France, William's parents had a simple, but wholly appropriate and moving inscription carved into his headstone: 'Teribus'. Maj. William F. Beattie was a member of the Hawick Lodge No. 111 and shortly before his death he was made a life member of the Lodge. His name is commemorated in the Lodge room on the West Wall War Memorial. Maj. Beattie’s family donated his medals which are displayed in a cabinet and also his sword to the Lodge, the sword is used to this day by the Lodge Tyler who incidentally is called Willie Beattie! A Hawick Word Book – Douglas Scott. Version 2013. 'All These Fine Fellows - Hawick and The Great War 1914 - 1918' - Derek Robertson. This website was designed by SRA76 Masonic websites.